Much damage occurred in the pacific region after the mighty typhoon Mangkhut left a path of destruction spreading from the Philippines, through China and the Pacific, also creating havoc on the island of Guam. 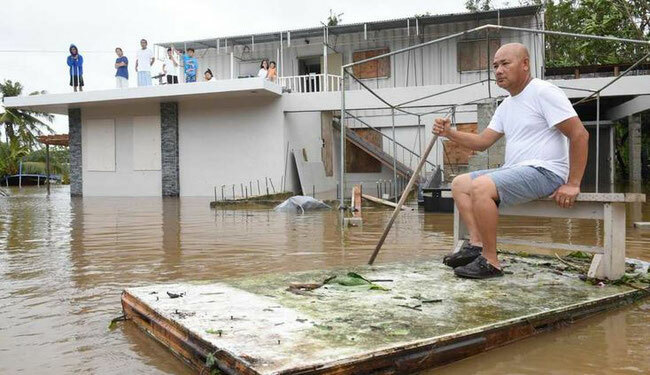 A speedy Airlift Relief Program was put into action by the U.S. government to bring relief to the island’s inhabitants. Antonov Airlines AN-225 ‘Mriya’ transport flew a total of 33,000 kilometers in six days between September 9th to September 15th, carrying emergency supplies for the Pacific island of Guam which was hit very hard by Typhoon Mangkhut. The U.S. government contracted Air Partner to arrange relief flights and they contacted Antonov Airlines who provided the mighty AN-225 freighter. The aircraft positioned empty in a 13-hour flight from Kiev to San Francisco’s Oakland Airport where it uplifted 123 tons of relief supplies before moving on to Guam Airport. The aircraft’s load / unload ability through the nose door enabled a swift offload and distribution of the relief goods. There is an Open Skies Agreement in existence between the Ukraine and the U.S. This enables Antonov Airlines to operate unlimited flights into U.S. territories, especially charter flights which are fixed at short notice. Fresh water became very short on the island and Volga-Dnepr was commissioned by the Washington administration to uplift around 70 tons of potable water as a first step to cater for ensuring the inhabitants had fresh water before local supplies could be brought back on line. The charter was arranged and completed within 72 hours. The ops carried out by Antonov Airlines and V-D again showed flexibility of the AN freighter fleet for such missions.